NASA has officially called an end to the historic Opportunity rover mission, ending a spectacular, 14-year adventure on the Red Planet. One of the rover’s most intriguing discoveries, however, came just two months after it landed, when it stumbled upon tiny objects bearing a startling resemblance to blueberries — the nature of which still divides scientists today. The blueberries, he said, were the hematite seen from orbit — little balls of material that grew slowly from the watery solutions percolating through the rocks. Similar hematite concretions are known to occur on Earth, he said, but they are usually larger. As for the apparent blueish colour of the blueberries, McSween said they’re actually grey. The MER team “chose certain wavelengths of light to use for the images, and that had the effect of making them appear blue,” he explained. This conclusion, that the balls formed from accretion, meant that water once existed on the Martian surface. Today, this is a well-accepted fact, thanks mostly to observations made by the Curiosity rover, but this wasn’t known at the time the blueberries were discovered. But the Martian blueberries story didn’t end there. 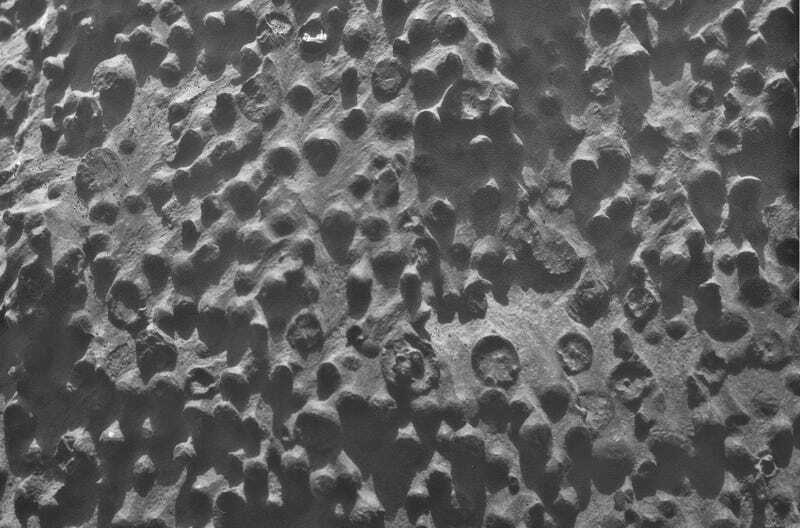 In 2005, a Lunar and Planetary Science paper, co-authored by Donald Burt from ASU School of Earth and Space Exploration, claimed the MER analysis made no sense, and that something else had to be responsible for these odd surface features. “There are many problems with [the MER] hypothesis, the most important of which include their nearly perfectly spherical shape (unlike highly irregular normal concretions), their uniform size range (never larger than about 7 mm, whereas normal concretions can reach huge size), their uniform distribution across a huge volume and area of rock (many concretions tend to be concentrated at chemical reaction fronts), their failure to clump together, other than a couple of loose doublets and single triplet, and their unusual mineralogy,” Burt wrote to Gizmodo. By “unusual mineralogy,” Burt is referring to their greyish-blue exterior, which suggests the objects formed under high temperatures. On Earth, such objects, known as specular or shiny hematite, typically form in hot springs or volcanic steams. Normal sedimentary concretions, he said, form at low temperatures, but they’re comprised of dull and not shiny iron. To explain the Martian blueberries, Burt, along with his co-authors Paul Knauth and Ken Wohletz, revisited an earlier consideration: meteorite impacts. 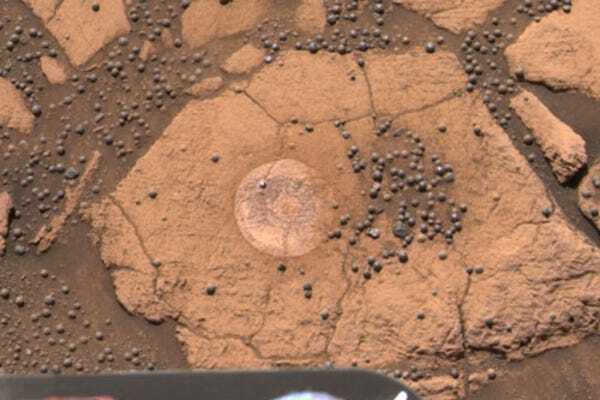 In another 2005 paper authored by the same team, this one appearing in Nature, the scientists suggested that the pebbles were an unusual type of impact spherule, formed by the complex tumbling interactions between iron flakes and the sticky, acidic, and salty steam and dust clouds produced by major meteorite impacts on the iron-rich Red Planet. Interestingly, a 2014 study led by geophysicist Anupam Misra from the University of Hawaii, published in Planetary and Space Science, reached the same conclusions — that the Martian blueberries are not accretions and that they formed from meteorites. Misra’s primary argument was that the concretion theory couldn’t explain the narrow sizes of the Martian blueberries, whereas the meteorite impact theory could. Based on [field observations] and chemical modelling, the scientists suggested that floods of iron-rich, gently acidic water washed over the original calcite structures. Unlike the terrestrial versions, Martian blueberries seem to be made of hematite all the way through, no longer sporting any calcite heart. But that could point to a long period of overwash that ate through all the calcite, the researchers said. Clearly, the debate about the Martian blueberries is still a lively one, but as Burt explained to Gizmodo, this ongoing scientific argument wouldn’t have happened without Curiosity and researchers committed to sharing information with the public. The true nature of the Martian blueberries remains an enigma. It’s a testament to the wild success of the Opportunity rover that what was supposed to be a 90-day period of exploration lasted over 14 years, uncovering Martian mysteries that continue to perplex scientists. Opportunity and Spirit’s contributions will continue to reverberate through the scientific community for years to come.